Are you renting your property out via Airbnb? Airbnb is an example of the “sharing economy” — connecting buyers (users) and sellers (providers) through a facilitator that usually operates an app or a website. Airbnb acts as this facilitator by allowing individuals, referred to as “hosts”, to rent out a room of their house or their whole house on a short-time basis via its online platforms. While the focus here is on Airbnb, the tax concepts outlined could be applied in a more general sense to anyone seeking to rent out a part of their home, whether through Gumtree, Realestate.com.au, Flatmates.com.au and so on. Airbnb property rental taxes are a real issue that cannot be ignored. The main question hosts need to ask themselves here is whether a commercial amount of rent is being charged. Generally, where a room is advertised for rent at market rates to the general public through Airbnb (or a similar online directory, but we’ll use Airbnb as the generic term) the arrangement is likely to be at “arms-length” and hosts would be required to declare their rental income. Where the rental arrangement is at “arms-length” and income is declared, hosts would be entitled to tax deductions for expenses incurred in deriving that rental income. Expenses that are directly associated with the rented area – deductible in full. Expenses that relate to shared areas – apportionment required. Expenses that relate to the host’s private area only – not deductible. Where there are expenses that relate to the entire property, apportionment is required. The ATO has indicated that floor space can be used as a general approach for apportioning expenses. It is important to note that where capital works are undertaken in relation to the property, capital works deductions are generally not available to hosts, as they are also using the property for their own residential accommodation. Expenses that relate to shared areas can be apportioned based on access. In regard to using floor space as an indicator, if say one tenant and one host had equal access to shared areas, the host could, therefore, claim for 50% of these expenses. One final thing to note in relation to expenses is that they are only deductible where an area of the house is either actually rented out, or genuinely available for rent. For example, where a room in the host’s home is only available for rent for 90 days a year, say while a housemate is away, then only the portion of rental expenses that were incurred during that 90-day period would be deductible and further apportionment may be required. In general terms, the sale of an individual’s primary residence is CGT-free under the main residence exemption if the dwelling was their main residence for the entire time they owned it, and it was not used to produce assessable income. 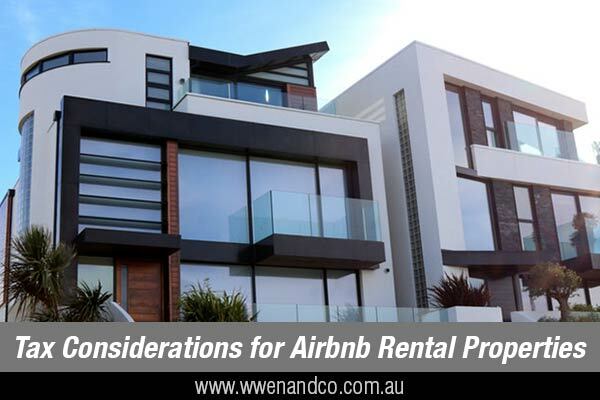 However, as hosts are renting out a portion of their home on Airbnb, they are using a portion of it to produce assessable rental income and therefore would only be only eligible for a partial main residence exemption. This means that hosts may be taxed on a portion of any capital gain realised upon the sale of their main residence. Remember that “pre-CGT” assets (bought before 20 September 1985) are not subject to CGT, regardless of whether they are used to derive rental income. A basic scenario would be one in which a host rented out the same part of their home from the time that they purchased it until the time that they sold it. In this case, the part of the home used to produce assessable income would be subject to CGT and the private portion of the home would be CGT free under the main residence exemption. As with expenses, an apportionment based on floor space may be used to determine the portion of the property that is subject to CGT. A more common scenario may be where the host began renting out a part of their home sometime after moving in. The calculations under this scenario can differ depending on whether the host first began using their home to produce assessable before or after 7.30pm on 20 August 1996. The reference “first used to produce assessable income” would generally be the first time a host rented a part of their home out (whether on Airbnb or otherwise). However, if the host had previously used part of their home as a home office or workshop at some time in the past, it may actually be that time that the home was “first used” to produce assessable income. Where the host first used their home to produce assessable income prior to 7.30pm on 20 August 1996, they would need to calculate the portion of the ownership period in which they used the entire house for private purposes and the portion in which they were renting part of the house out. This gross capital gain could then be reduced further by either indexation or the general 50% CGT discount, as the property was held for at least 12 months. Where the host first used their home to produce assessable income post-20 August 1996, the calculation is slightly different. Firstly, the host is deemed for tax purposes to have acquired the property as at the date that the house was first used to produce assessable income and secondly, a market valuation, calculated at that date, may be required, which is then taken to be their deemed cost base to be used in calculating any future capital gain. This valuation could come from a registered valuer or could be calculated by the host, however it is important to note that the ATO has the power to challenge valuations. Income from renting out part of a residential property is typically “input-taxed”. This means that hosts should not charge GST on the rent that they earn from guests. Conversely, hosts cannot claim input tax credits for any rental expenses that they incur but are entitled to claim the GST inclusive amount of any rental expenses as a tax deduction. Be aware however that GST may apply if the host is taken to provide “commercial residential premises” – which includes, among other things, an accommodation that is a hotel, motel, inn, hostel or boarding house. Remember also that being registered for GST is subject to the host exceeding the $75,000 turnover threshold. If hosts report more than $2,000 of rental income on their latest lodged tax return, they may receive a letter from the ATO notifying them that they are required to begin making periodic PAYG instalments. These are essentially prepayments of tax that are offset against the host’s final tax liability at the end of the year upon lodging their tax return.